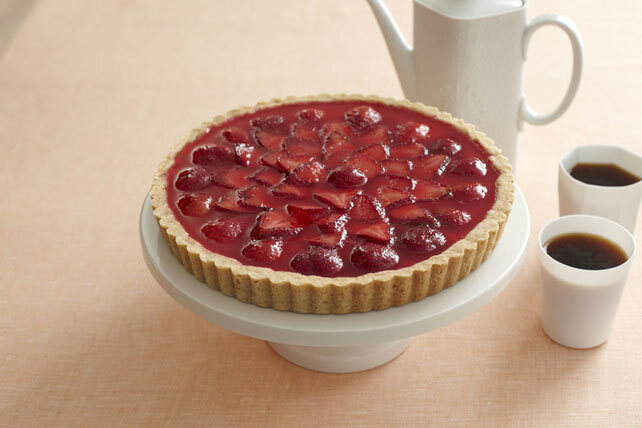 Get better-than-ever strawberry sweetness with this delectable Glazed Strawberry Tart. Watch the video to learn how to make this pretty pastry today! Mix flour and brown sugar in medium bowl until blended. Cut in butter with pastry blender or 2 knives until mixture resembles coarse crumbs; knead with hands to form ball. Press onto bottom and up side of 10-inch tart pan with removable bottom. Bake 15 min. or until golden brown; cool completely. Meanwhile, bring 1/2 cup granulated sugar, cornstarch, dry gelatin mix and water to boil in saucepan, stirring occasionally; cook and stir 2 min. Cool 20 min. Beat cream cheese, remaining granulated sugar and zest in large bowl with mixer until blended. Whisk in COOL WHIP; spread onto bottom of crust. Top with berries and gelatin glaze. Refrigerate 3 hours or until chilled. Run knife around tart to loosen from rim of pan; remove rim. If you don't have a tart pan, you can use a springform pan instead. Press dough for crust onto bottom and 1 inch up side of pan. Run sharp knife around edge of pan immediately after removing tart from oven to loosen tart. Do not remove tart from pan until glaze is set.